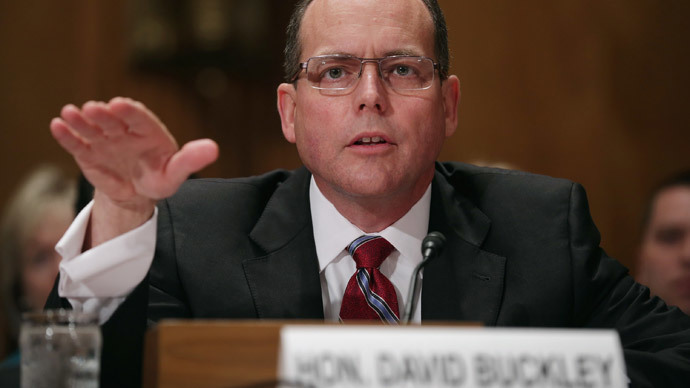 The internal watchdog for the Central Intelligence Agency, David Buckley, will resign at the end of January. Buckley was the key figure behind a report on allegations that the CIA spied on senators trying to investigate its post-9/11 torture techniques. News of his resignation came Monday from the CIA. According to a statement released by the agency, Buckley – who has served as the inspector general for more than four years – has been planning to leave his position for months, and is leaving to accept a position in the private sector. It’s very rare that an inspector general’s resignation makes headlines, but Buckley’s departure comes after what turned out to be a very rocky year for the CIA. Not only did the Senate Intelligence Committee finally release its long-awaited report on the torture techniques used on suspected terrorists and other militants, but lawmakers investigating the issue also accused the CIA of hacking into their computers in an attempt to stall or prohibit the report’s publication. That last allegation resulted in harsh words from Congress, sparking an internal investigation into the matter led by Buckley. When Buckley’s report was released in July 2014, it found that several CIA employees – three technology officers and two lawyers – wrongfully hacked or gained access to computer networks used by Senate researchers. It also found that the CIA improperly read Senate emails, specifically noting that officials “acted in a manner inconsistent with the common understanding" with lawmakers. Despite these conclusions, the accountability panel installed by the CIA in order to determine punishment will not discipline the officials involved, a New York Times report stated in December. Speaking with Reuters, the American Civil Liberties Union and other civil liberties groups were downbeat about Buckley’s departure. "The CIA inspector general is one of the few people who has tried to impose some accountability on the CIA at a time when the White House and many in Congress are failing to do their oversight jobs," said the ACLU’s Christopher Anders. Danielle Brian, the executive director of the Project on Government Oversight, told the news agency that considering Buckley’s report on the CIA’s behavior, “the lack of repercussions is very troubling and his departure so soon afterwards is troublesome." The same day that Buckley’s resignation was announced, Senate Intelligence Committee Chairwoman Dianne Feinstein (D-Calif.) sent a letter to President Barack Obama recommending ways to prevent the United States from employing torture again in the future. In addition to proposing legislative fixes for the issue, Feinstein suggested that the CIA director order that all future covert actions undertaken by the agency be reported to the inspector general. Regarding Buckley’s resignation, she said “it is critically important to have a strong, independent inspector general at the CIA due to the nature of the work done there, and Mr. Buckley filled the role admirably." “I look forward to the president’s nomination of a new IG and swift consideration by the Intelligence Committee,” she added.